Government authorities in Japan have announced new plans to start dumping highly radioactive wastewater from the failed Fukushima Daiichi nuclear power facility directly into the Pacific Ocean. Though the amount of radiation in the water far exceeds legally-permitted levels, according to the plant’s operator and documents reviewed by the U.K.’s Telegraph, there’s apparently no other place to put it at the site, which is on the verge of seeing its storage capacity completely maxed out. Reports indicate that approximately 1.09 million tons of contaminated water currently being stored inside 900 tanks at Fukushima will soon be drained in the Pacific in order to make more space for new water, a move that’s sparking outrage among local residents and a number of environmental organizations that worry about what the vast contamination will do to the world’s largest body of water. The announcement is sure to be puzzling for anyone who believes the narrative that’s long been conveyed by the Tokyo Electric Power Company (TEPCO) that nuclear wastewater at the Fukushima site is “safe,” containing only small levels of the radioactive contaminant tritium. It also brings up questions about the repeated assurances from the Japanese government that a so-called “Advanced Liquid Processing System,” or ALPS, developed by the nuclear arm of Hitachi Ltd., has been effectively removing all other radioactive materials to “non-detect” levels, which doesn’t seem to be the case. When asked about these documents, Hitachi reportedly declined to comment on the performance of its ALPS technology. The Japanese government similarly refused to respond to multiple requests for comment about the seeming disparity. According to The Telegraph, other “restricted” documents suggest that the arm of the Japanese government responsible for handling the Fukushima disaster didn’t even know that ALPS was “malfunctioning,” and not actually removing harmful radionuclides to “non-detect” levels. So there’s no telling what the actual levels are of nuclear radiation being dumped from the site into the Pacific. A study conducted by the Kahoko Shinpo newspaper found in 2017 that 45 of 84 water samples collected from near the Fukushima site tested extremely high for iodine 129 and ruthenium 106, at levels far above what’s considered “acceptable” even by liberally-defined government standards. Keep in mind that iodine 129 is known to cause thyroid cancer, and has a half life of 15.7 million years – meaning it’s not going anywhere once released into the environment. Ruthenium 106 is similarly carcinogenic and high-risk when its comes to its environmental pervasiveness. And it was just last month that TEPCO was forced to admit that a shocking 80 percent of its stored wastewater still contains radioactive substances at levels far beyond what was established by the Ministry of Economy, Trade and Industry. “Tepco has now admitted that levels of strontium 90, for example, are more than 100 times above legally permitted levels in 65,000 tons of water that has been through the ALPS cleansing system and are 20,000 times above levels set by the government in several storage tanks at the site,” explains The Telegraph. What this all suggests, of course – and affirming what we’ve been saying all along – is that TEPCO has for years been lying about the true level of radioactive contamination at the Fukushima site. There’s also no telling to what degree harmful radiation has already been dumped into the Pacific Ocean, only to spread far and wide across the globe. 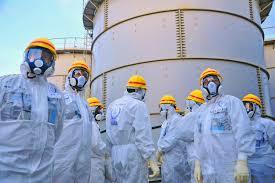 For more Fukushima-related news, be sure to check out Fukushima.news.